The time honored art and craft of traditional rug hooking leads off the schedule of Thompson-Ames Historical Society ’s Calendar of Events for 2006. Carol Dale of Gilford will be the teacher and supplier for the Saturday morning hooking bees and the Tuesday all day classes. These two types of events will be running concurrently. On the Saturday mornings of January 7, February 4, and March 4, from 10:00 a.m. until 12:00 noon, Thompson-Ames Historical Society will offer rug-hooking bees in Grange Hall, at 8 Belknap Mountain Road in Gilford Village. The bees are open to all and do not need pre-registration. Anyone who would like to see what rug hooking is about, start a project, or bring in a current project is welcome to attend. There is no cost unless supplies are purchased. Ms. Dale will have a selection of rug hooks, hoops, and wool on hand to provide the necessities. Books will be available to browse through to fire up the imagination or to revel in the antique rugs of the 19th century in America. Furthermore, since Carol Dale also repairs and restores old hooked rugs, participants are welcome to bring in a treasured hooked rug to have it examined with suggestions to be made as to how the rug can be fixed. Each of Thompson-Ames Historical Society bees provides an opportunity for those interested in the heritage arts to come to see and learn, share stories, display items already made, or start a new item. The other rug-hooking event will be a series of day-long classes to be taught by Carol Dale. The classes will be held every other Tuesday in Gilford Village in Grange Hall from 10:00 a.m. until 3:00 p.m.
Each series requires pre-registration and pre-payment of $75 for a cycle of five classes. A percentage of the fee will be donated towards Thompson-Ames Historical Society’s utility expenses. 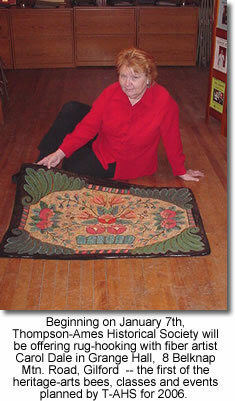 The winter series of rug-hooking classes is scheduled to meet on January 10 and 17, February 7 and 21, and March 7. Each full-day class is designed to allow in-depth instruction with lots of opportunities for problem solving, idea generating, and the fun of each participant using her creativity. Each participant may bring current projects or start a new one. Beginners and experienced rug hookers alike are welcome to join in the fun and camaraderie of creating beautiful and useful hand-hooked rugs and wall hangings. The opportunity to create ornaments, pins, and mug rugs (coasters) will also be included if the attendees are interested. An occasional dye session will be presented to acquaint students with the excitement of working with color and wool fabric. For the all-day classes, each participant is asked to bring a bag lunch. Coffee and tea will be available. Those interested in the classes are asked to call Carol Dale at 293-4113 to pre-register and to discuss their needs and interests. A minimum of six students is needed to assure the series of classes will be held. Carol Dale plans to teach both tapestry hooking and primitive hooking. “Friendship,” the rug in the photograph, is an example of a primitive hooked rug. It is hooked on a durable linen backing, using wool fabric strips more than 1/8 inch wide, and hooked in an outline and fill style. “Custom dyed wools and a variety of plaid wools were used in this rug to give it life and sparkle,” Carol Dale explained. We learned that the rug “Friendship” was designed by Gardner King of Fitchburg, Massachusetts, probably during the 1940s or 1950s. Mr. King and his wife traveled throughout New England and New York, recording many old rugs and committing them to paper or burlap patterns. Also, Mr. King accumulated an enormous supply of woolen fabrics that he acquired as scraps and mill ends from the numerous woolen mills in New England. It was at a rug-hooking camp in Sebago, Maine, in the 1980s, that Gardner King’s daughter, Rosalie Lent, and Carol Dale met. A full schedule of Thompson-Ames Historical Society offerings, including heritage arts bees, will be made available shortly on the Society’s website, www.gilfordhistoricalsociety.org. In the meantime, please call T-AHS at 527-9009.